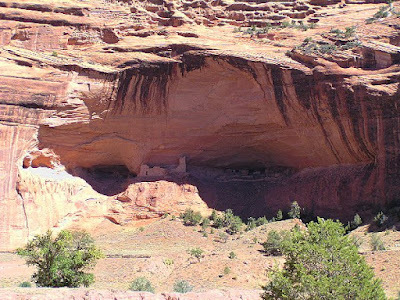 Mummy Cave, Canyon de Chelly. Do you see Frankenstein? The section of ruins to the left. The section of ruins to the right. 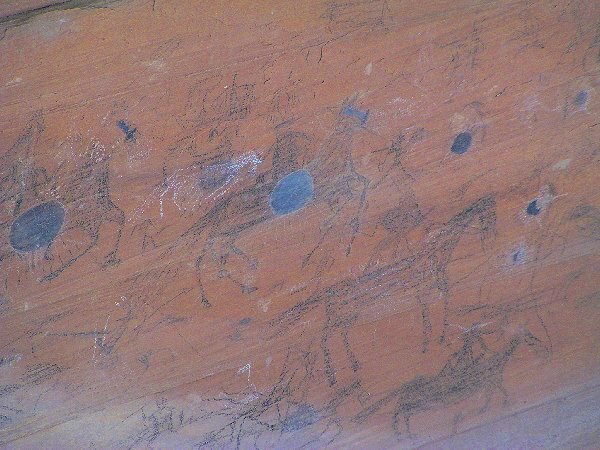 Some of the cave art. Click any photo to view full size. I see him..the eyes, the fringe of black hair..Frankenstein! The minerals and metals in the sandstone are what cause the streaks, and depending on the substance, the streaks are different colors. 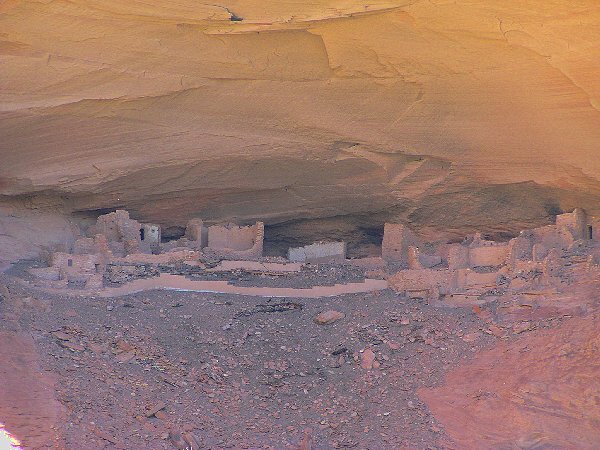 They're called "Navajo tapestry walls" and many need very little imagination to "see" all sorts of wonderful images. 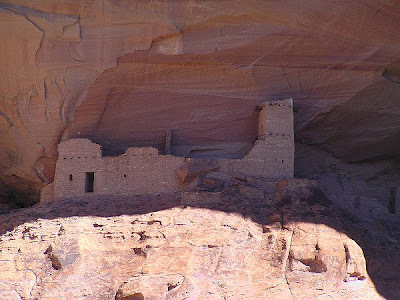 I haven't been to Canyon de Chelly in years! So fun to revisit. Love Frankenstein. I wondered if you'd ever been there. I should've known the answer would be yes! I do see Frankenstein! I'd love to visit one of these ruins; have only seen them from afar when driving through Arizona. Afar just doesn't hold a candle to close up! One of these days I'm going to have to go west and see this in person. When I do get to roam around ancient ruins I have to be dragged away. In Pompeii the tour group was going to leave without me! 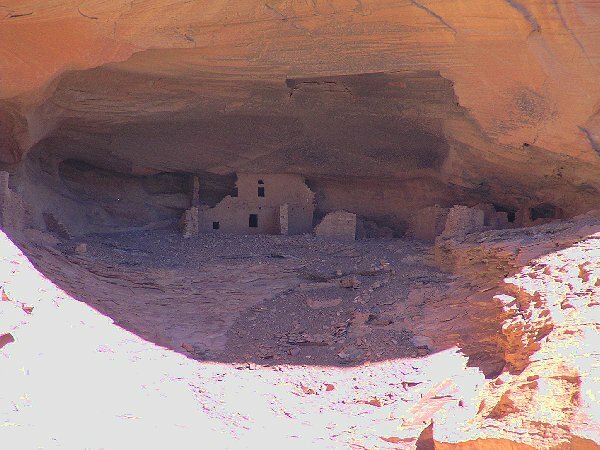 The Navajo are very careful to ensure that no one is left behind! I saw Frankenstein too! Great photos! Great place ... would love to go back one day. Thanks for sharing your photos. And yes, I do see Frankenstein. Hi you! Would you mind if I shared these with my students at school? We are studying Native tribes of Arizona and the students are doing research reports. Let me know! Have a blast with your house guests!! I've already contacted you about this, so you know my answer. As for my house guest-- I'm having so much fun that I keep forgetting to turn on the computer!!! I think I have pictures of that, only from the rim of the canyon. We couldn't afford to go down on a tour and just drove ourselves around on the public roads. I had a zoom lens with a doubler attached on the camera, which made the shots look very close up even though we were some distance away. The first time Denis and I went, we just took the rim road, but we knew we had to come back for the tour into the canyon. We did. Then our niece from the UK came for a visit, and we wanted to take her on the tour, but the river that runs through the canyon was so flooded that they weren't letting anyone in. I do want to go back again.